I've made my oatmeal cookies so many times I'm starting to get tired of them. Not of eating them, just of baking them. I like a little variety! 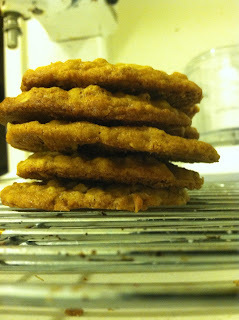 So, while they remain my most requested cookies in their chocolate chip form, I wanted something different. Enter molasses. Or rather, enter whatever random ingredient is in my pantry that might go well with oatmeal, butter and sugar. Enter molasses. 1. Preheat oven to 375 Degrees Fahrenheit. Lightly grease baking sheets by rubbing butter wrapper over tem. Or put parchment paper on the sheets. Either way, don't want your cookies sticking. 2. Blend sugars and butter until smooth. Add in eggs and vanilla and mix well. Add in molasses and mix . Sift together flour, salt, baking powder, baking soda, and cinnamon. Slowly add to butter mixture, mixing until well incorporated. Add in coconut and oats and mix until well blended. Mixture will be very stiff. 3. Drop by the Tablespoon-full on baking sheets at least one inch apart. Bake at 375 for 8-10 minutes, until edges just begin to appear crispy. 4. Remove from oven and allow to cool on baking sheet for two minutes. Transfer to cooling racks. 5. Pour milk, dunk, consume.